It was after Joe Garagiola stopped playing pro baseball that his fortunes took off. 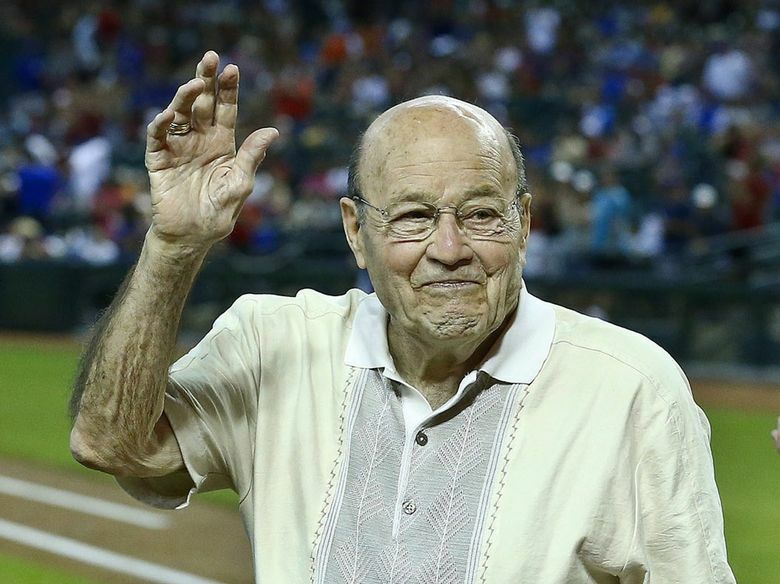 Joe Garagiola, who spent nine forgettable seasons in the major leagues as a weak-hitting catcher and then parlayed his witty tales of life as a baseball underachiever into a far more notable career as a folksy broadcaster and television personality, died Wednesday in Scottsdale, Ariz. He was 90. Major League Baseball announced his death. Mr. Garagiola was propelled from the catcher’s box into the broadcast booth largely by his crowd-pleasing appearance before a U.S. Senate subcommittee on monopoly practices in April 1954. At the time, he was playing for the Chicago Cubs. The committee chairman, Sen. Edwin Johnson, D-Colo., had sponsored a bill to make corporate ownership of baseball teams illegal and was targeting one of Mr. Garagiola’s former teams, the St. Louis Cardinals, who were owned by the Anheuser-Busch brewery. Mr. Garagiola, who was near the end of his playing career, had been looking for a radio job in St. Louis. Because the advertising agency working on his behalf also represented the brewery, Johnson suggested the Cardinals were guilty of “tampering” by improperly trying to lure him from the Cubs. “Senator, how can you tamper with a .250 hitter?” Mr. Garagiola said. His testimony, laced with the self-deprecation and irreverence that would become his trademarks, attracted enthusiastic press coverage and earned him a broadcasting job with the Cardinals. He went on to be a colorful broadcaster for NBC, which also made him a host of the “Today” show and a game-show personality, always recognizable by his bald head and broad smile. He was later a broadcaster for the New York Yankees and the Arizona Diamondbacks. He was inducted into the broadcasters’ wing of the Baseball Hall of Fame in 1991 as a recipient of the annual Ford C. Frick Award. Longtime sportscaster Bob Wolff, who teamed with Garagiola on NBC, admired his style. During his playing days, Mr. Garagiola spoke at banquets and found he could make people laugh. As he had done in his congressional testimony years before, he continued to find humor in his own foibles. Joseph Henry Garagiola was born in St. Louis on Feb. 12, 1926, and was raised on the Hill, an Italian working-class neighborhood, where his father, Giovanni, was an immigrant laborer. His best friend and teammate on the makeshift ball fields was a boy who lived across the street, Yogi Berra. Mr. Garagiola joined the Cardinals’ minor league system at 16 while Berra was starting out in the Yankees’ organization. Mr. Garagiola made his major league debut with the Cardinals in 1946 and batted .316 in their seven-game World Series victory over the Boston Red Sox that year, getting four hits in Game 4. That proved the high point of Mr. Garagiola’s on-field career. He was traded to the lowly Pittsburgh Pirates during the 1951 season and, after a stint with the Cubs and a few games with the New York Giants, retired after the 1954 season, having played in only 676 games, with a career batting average of .257. Mr. Garagiola was hired by the Cardinals’ flagship radio station, KMOX, when his playing days ended and teamed with Caray and Jack Buck. Mr. Garagiola was hired by NBC-TV in 1961 for its “Game of the Week,” joining Lindsey Nelson for one season and then working with Wolff. He later teamed with former Yankee Tony Kubek and then Vin Scully, broadcasting regular-season games along with the playoffs and the World Series. Mr. Garagiola replaced Mel Allen with the Yankees and was a member of their broadcast team from 1965 to 1967, along with Red Barber, Phil Rizzuto and Jerry Coleman. With Berra’s career as a Yankees catcher propelling him toward the Hall of Fame, Mr. Garagiola embellished his boyhood friend’s image with his tales of Yogi the Everyman philosopher. Berra, who died in September, said he came up with one of his better-known pronouncements, “When you come to a fork in the road, take it,” while giving Mr. Garagiola directions to his home in Montclair, N.J. There really was a fork near his house, and the roadways it split into both wound up at the Berra home. Mr. Garagiola was a broadcast commentator for the Diamondbacks in his later years and retired from broadcasting in February 2013. His son Joe Garagiola Jr. was the general manager of the Diamondbacks and is now Major League Baseball’s senior vice president for standards and on-field operations. Besides his son, the elder Garagiola is survived by his wife, Audrie; a daughter, Gina; another son, Steve; and eight grandchildren, according to Major League Baseball. His commentary on the USA Network for the Westminster Kennel Club dog show at Madison Square Garden made him the inspiration for the character Buck Laughlin, played by Fred Willard, in “Best in Show,” Christopher Guest’s 2000 documentary spoof. Mr. Garagiola was not amused. “I think the satire went way over the top,” he told The New York Times. Mr. Garagiola was a longtime president of the Baseball Assistance Team, which provides confidential financial assistance to needy former baseball figures. Warning of the risk of cancer, he campaigned vigorously against the use of chewing tobacco. In 2013, the Baseball Hall of Fame gave Mr. Garagiola the Buck O’Neil Lifetime Achievement Award for his contributions to the game.